Safeguard workers and property from fire and explosion hazards with the 2018 edition NFPA 34. Up-to-date rules address dipping coating and printing operations. Vital to fire safety in many industrial facilities, NFPA 34: Standard for Dipping, Coating, and Printing Processes Using Flammable or Combustible Liquids addresses dipping, roll coating, flow coating, printing, and similar processes using flammable or combustible liquids. Clarifications in Chapter 1, Administration support proper application. For example, this edition specifies that Chapter 14 shall apply only to miscellaneous spray operations, and Chapter 18 shall apply only to spray application processes or operations that are conducted in temporary membrane enclosures both inside and outside buildings and structures. Modified Chapter 3, Definitions includes changes made to the definitions for liquids and materials that are consistent with other NFPA® codes -- placing noncombustible material, limited combustible material, and classification of liquids and determination of flash points in a General Requirements section. Changes to definitions are consistent with NFPA 1: Fire Code, NFPA 30: Flammable and Combustible Liquids Code, and NFPA 5000®: Building Construction and Safety Code®. Revisions in Chapter 4, General Requirements clarify definitions and location of dipping, coating, and printing processes. Additional supporting material in Annex A is also provided. Revisions in Chapter 5, Design and Construction of Dipping, Coating, and Printing Equipment and Systems remove the exception and clarify construction for secondary enclosures. Revised Chapter 6, Electrical and Other Sources of Ignition include updated figures in Chapter 6 and Annex A that improve consistency and to clarify electrical classification requirements. 4.1 GeneralLocation of Dipping, Coating, and Printing Processes. 4.4 Access to Means of Egress. 4.8 Determination of Flash Point. 5.10 Control of Liquid Temperature. 6.3 Electrical Area Classification — Class I Locations. 6.4 Areas Adjacent to Open Processes. 6.5 Areas Adjacent to Enclosed Dipping and Coating Processes. 6.6 Equipment and Containers in Ventilated Areas. 7.5 Routing of Exhaust Ducts. 7.8 Support of Exhaust Ducts. 8.3 Storage in Process Areas. 8.5 Handling Liquids at Point of Final Use. 9.2 Automatic Fire Protection Systems. 9.5 Automatic Fire Protection for Small Dipping Processes. 9.6 Automatic Fire Protection for Enclosed Processes and Large Processes. 9.7 Requirements for All Fire Protection Systems. 9.8 Specific Requirements for Automatic Carbon Dioxide, Dry Chemical, Clean Agent, and Water Mist Systems. 9.9 Specific Requirements for Water-Based Fire Protection Systems. 9.10 Automatic Fire Protection for Printing Processes. 10.6 Combustible Dusts and Residues. 10.9 Solvent Distillation Units (Solvent Recyclers). 11.3 Requirements for Electrical System and Components. 11.10 Drip Plates and Screens. Reduce fire and explosion hazards during dipping coating and printing operations to safeguard workers and property with the 2015 NFPA 34. Water mist fire protection systems are now an approved method of fire protection, adding greater flexibility for designers and engineers. Modified terminology correlates with NFPA 70®: National Electrical Code® (NEC®), and revised graphics help you understand electrical classification requirements. Clarified exhaust discharge requirements are consistent with NFPA 33: Standard for Spray Application Using Flammable or Combustible Materials. Clarified requirements concerning recirculation and added a new definition of recirculation filter. Modified flammable storage requirements to be consistent with the 2015 NFPA 30: Flammable and Combustible Liquids Code and NFPA 33. 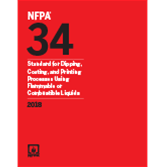 Interested in other editions of NFPA 34? Use the drop down menu above to select the edition year you need.